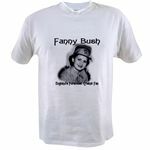 Yes, we have an exciting new line of Fanny Bush, England's Foremost Cricket Fan merchandise available right now! Click here now to get yours! Available only through CricketUSA!! Cricket In America -- Looking for cricket in America? This page lists web sites of organizations, clubs and leagues that have information about where you can find cricket in America. Please EMAIL us if you have a site to suggest! Of Low Skidders And Heavy Rollers -- All about pitches! The Absolute Basic Necessities -- Here is the absolute basic description of the game of cricket for beginners. Read this and then you will be ready to tackle The Devil's Dictionary of Cricket! The Devil's Dictionary of Cricket -- Need to know what a "duck" is? Don't know what "The Oval" is? Here's a glossary of terms to help America appreciate the second greatest sport in the world, spiced with just a pinch of the devil! At present, this file is over 150K, but it is well worth the effort and time to download! Shrine to Sir Donald George Bradman -- A page devoted to the greatest cricket batsman of all time, Sir Donald George Bradman. Link Your Website To CricketUSA®! -- Would you like to link to CricketUSA®? Our marketing department has been hard at work to bring you a variety of eye-catching artwork to use in your link! Links To Other Cricket Sites -- We've put together a list of links to other cricket sites, but we are hard at work updating it to make it more complete for you! Please EMAIL us if you have a site to suggest! Our Fanny often provides us with live updates from cricket matches all around the world. 0.95 per minute. Average call lasts 5 minutes. Must be 18 or older to call.